There will be another......as well as the ones in Bath and Totnes..... Looking forward to Sunday very much! Launching Flatpack is now underway. Hunting Raven Bookshop in Frome have copies to sell – and you can order through The Book on this site. Over 130 ‘Likes’ and 1800 viewings on Facebook, pre-orders through this site, and a great article in the Frome Standard…. in which I rather like the picture as it has me sharpening knives. Twitter account building a head of steam and bookings for the Official launch with the Radical Walk, which is nearly full – check Resources/Launch Events to see if there are spaces. The splendid Bread Print and Roses will be running another walk during the Frome Festival in July as well as different walks in Totnes and Bath in early May – details in the link above. 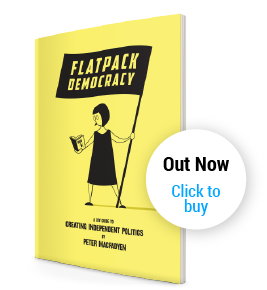 My main aim is to get enough copies of the book out to start using this site for discussing issues and enabling other potential democratic revolutionaries to share ideas and progress. I also have in mind drawing back in people from Liskeard – who took power as we did in Frome after a very fruitful exchange – and other places where groups of Independents are working together in various ways. There will be another……as well as the ones in Bath and Totnes….. Looking forward to Sunday very much!